This projector turns every room into a great home cinema. It connects with plenty of mobile devices including smartphones, all at a very affordable price. Abdtech 130 Mini LED Projector features AV/USB/SD/HDMI support, 800 lumen brightness, 34’’ – 130’’ projected picture size (1.07m – 3.8m distance), and 800:1 contrast ratio. According to its manufacturer, this projector boasts aspect ratio 4:3/16:9, and LED lamp life of 20,000 hours. 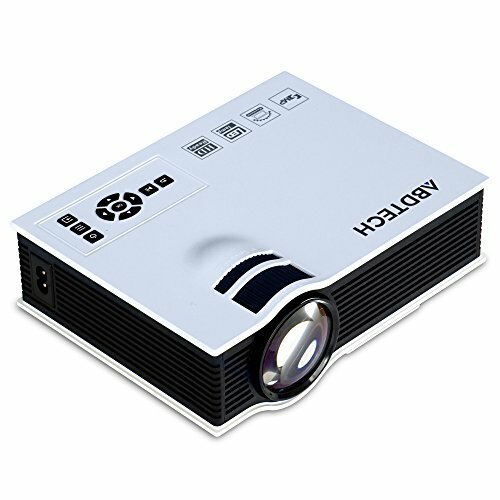 So, if you are looking for a small, affordable, but high quality projector, then look no farther. It is ideal for video game and home theater movies use. It is really an awesome family fun tool at a very reasonable price meaning you can have your own movie theater in your home. Just pop some popcorn and enjoy watching as many movies as you want in the comfort of your own home. Anyone who wishes to show movies at their home on a big screen (without having to break the bank in the process) should definitely consider purchasing this great projector. You mustn’t be fooled by this projector’s size. It is very lightweight as well as only around 6 by 8 inches in size meaning that it is extremely easily portable and great for outdoors use as well. This small package wraps up a vast variety of features though. For instance, there are a couple of options for input on Abdtech 130 Mini LED Projector, but more on that below. Also, it is quite important to mention that in case you are using this LED projector in outdoors or a noisier environment, you are definitely going to need to attach speakers to it. However, if you plan to use it for watching indoors, then your laptop or smartphone speakers will be more than enough. As we already mentioned, there are a couple of input options on this projectors. For instance, you can choose to hook it up to your laptop with an HDMI cable that you will need to purchase separately, but those are pretty inexpensive. Also, you are able to input your photos or movies directly from SD card or a USB flash drive since there are ports for both of those options. Finally, there is an AV cable that is included with this projector, and of course a port for this AV cable in order to play from HD sources. Furthermore, the Abdtech 130 Mini LED Projector features a port for attaching your speakers or headphones as well. This projector comes with a remote control and a power cord too. The remote control’s top boasts two dials. The bigger dial focuses your lens, and it is quite impressive how clear and crisp the picture appears as well as how easy it is to focus, whilst the rear smaller one tilts the picture in order for the viewers to get the best viewing angle possible. Lastly, there is a tiny leg on the projector’s bottom which screws in and out to lower or lift the projector to the right angle in order to center it on your screen.